Mothergunship - R140,00 : Game Hunt, Where we lead, others follow. MOTHERGUNSHIP mixes bullet-hell intensity with the FPS genre, and brings one of the largest gun customization options seen in video games. It's up to you to equip your over-the-top arsenal and defeat a robotic alien armada that has conquered Earth. Craft gun monstrosities that no reasonable person could ever lift, fight gigantic bosses and experience randomized mayhem as you battle your way to the heart of the fleet to destroy the MOTHERGUNSHIP! FIGHT - Face off against overwhelming odds in brutal, non-stop combat where thinking on your feet is the only way to survive. Dodge hundreds of bullets with unique FPS/Bullet-hell hybrid gameplay. Each ship hosts hordes of alien machines, deadly traps, and intimidating bosses, all set on preventing you from saving humanity. Go get 'em. CRAFT - To take down the MOTHERGUNSHIP, you'll need your very own personalized arsenal of destruction. Luckily, in MOTHERGUNSHIP you can create the gun of your dreams with one of the most modular gun-crafting systems ever seen in a videogame. Want to have twelve-barrel gun that shoots homing rockets? Or do you prefer a lightning shotgun? And what gun wouldn't look better with a fishtank affixed to the top? Go for it! The design of your destructive arsenal is in your hands. RESIST - Join the ranks of the resistance against the robotic alien invasion. 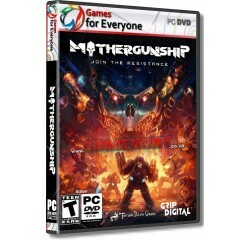 Destroy hordes of metallic fiends and earn your way to the Mothergunship! Processor - Intel Core i5-4430 or AMD FX-6300® or equivalent AMD® processor.